Tulsi Manas temple is one of the most famous temples of Varanasi. It is also an important tourist attraction of the holy city. The Tulsi Manas temple is located near the famous Durga temple. It was built in white marble in the year 1964. 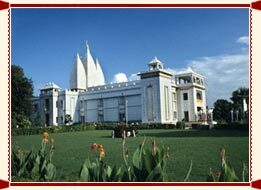 The temple has been made more charming by the magnificent landscaping around it. The Tulsi Manas temple is dedicated to lord Ram. It is believed to be built at the same place where Tulsidas wrote the famous Indian epic, Ramcharitamanasa. The walls of the Tulsi Manas temple are engraved with verses and scenes from the Ramcharitammanasa, the Hindi version of the Ramayana. The temple is open from 5.30 AM to noon and 3.30 to 9 PM.